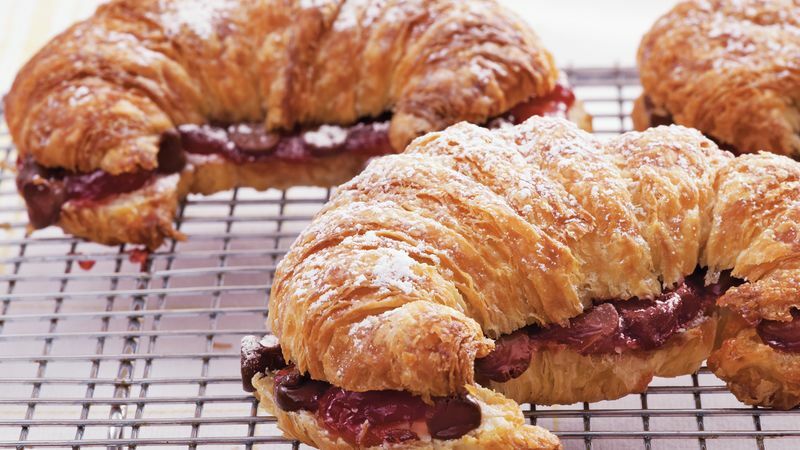 On bottom half of each croissant, spread 2 tablespoons cream cheese and 2 teaspoons preserves; sprinkle each with 1 tablespoon chocolate chips. Replace top halves of croissants. Place in pan. Bake uncovered 7 to 9 minutes or until heated through. Sprinkle with powdered sugar. Serve warm. It’s easy to vary the filling of these croissant sandwiches. Try apricot preserves instead of cherry, or strawberry cream cheese instead of plain. These would also be delicious with a savory filling, such as chive-and-onion or garden vegetable cream cheese and very thin slices of ham; omit the powdered sugar. Croissants vary in size. The ones we used were 4x5 inches; if yours are smaller, you might need more to use up the other ingredients.